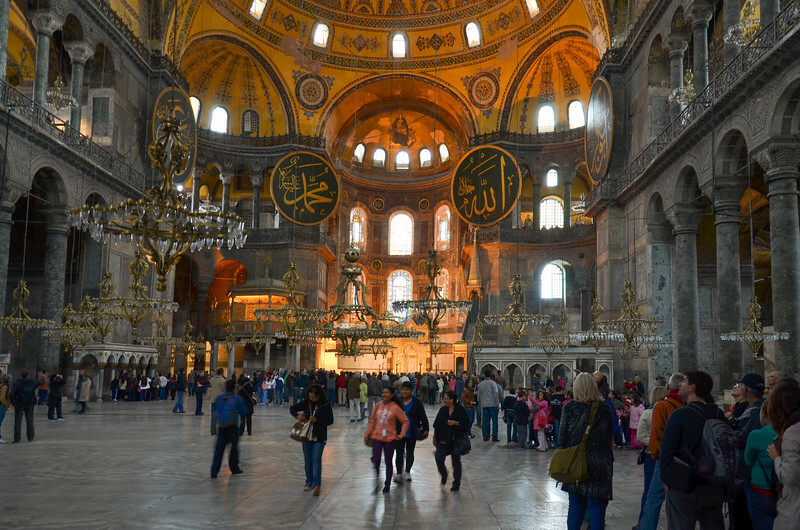 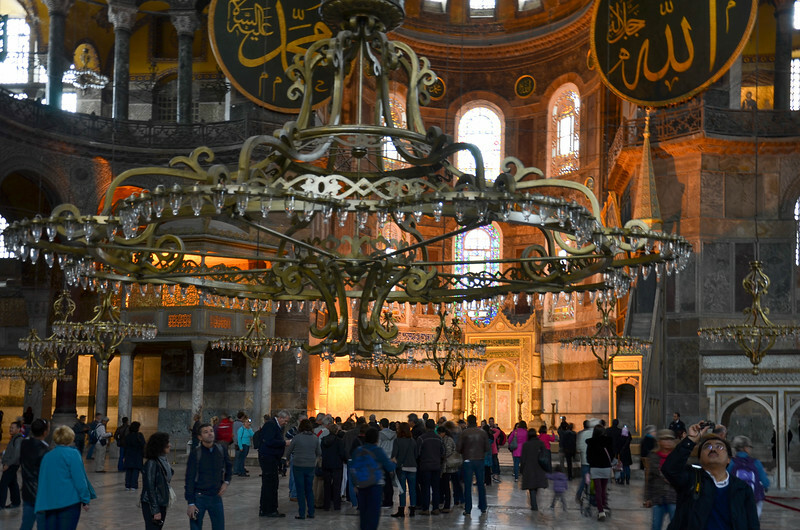 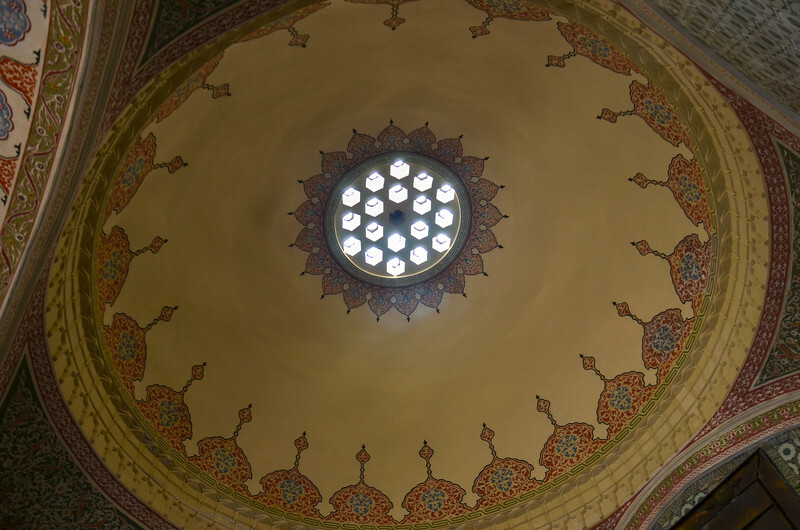 We started our trip with five nights in Istanbul, exploring this historic city's mosques, bazaars, and cuisine. 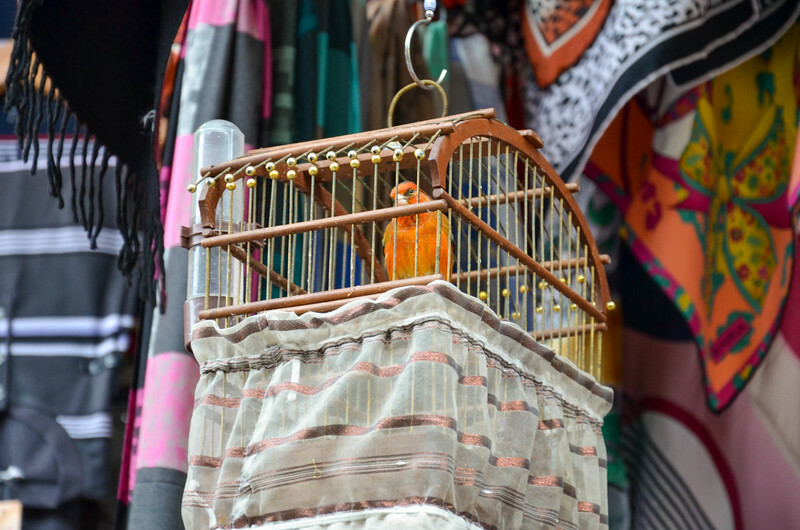 A bird outside a shop near the Grand Bazaar. 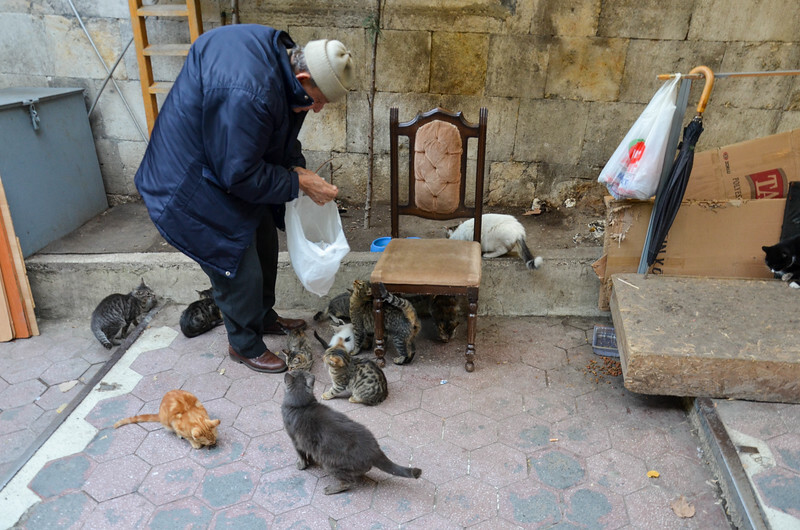 A man feeds a larger number of cats outside the Grand Bazzar. 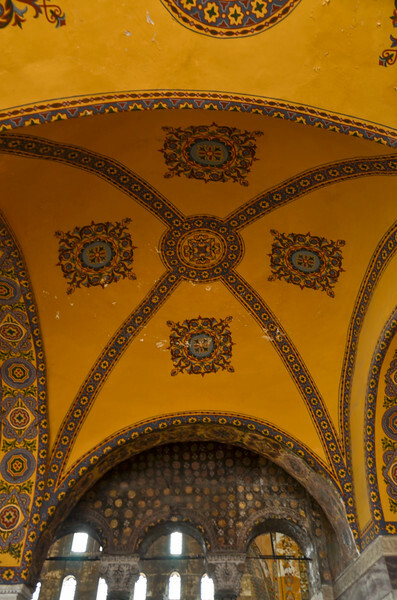 A bookstore in the Grand Bazaar. 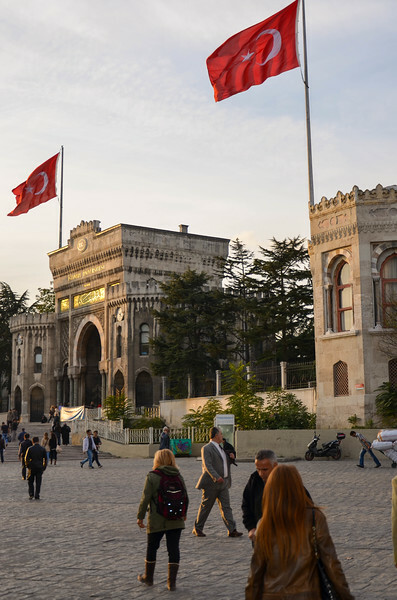 The entrance gates to the university in Istanbul. 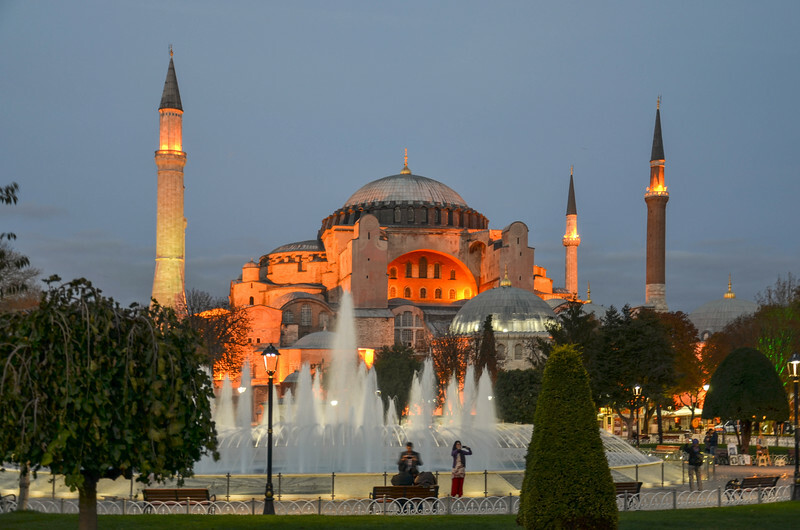 The Hagia Sophia at twilight. 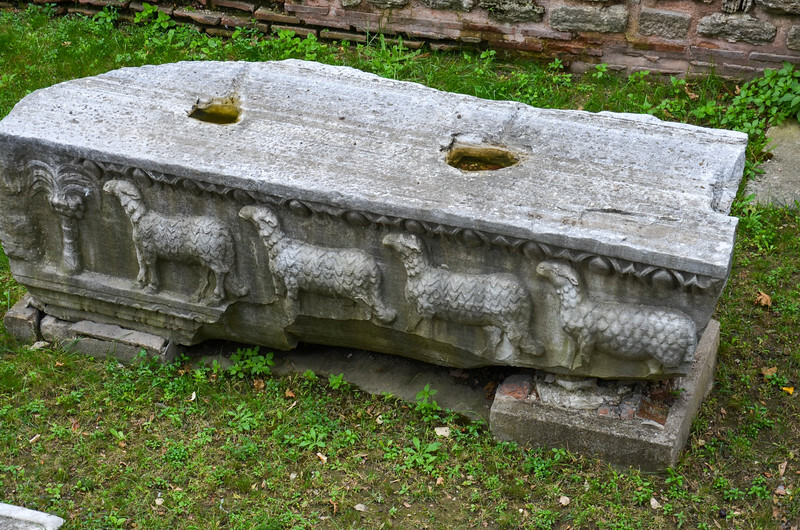 Ancient building fragments are on displayin the courtyard outside the Hagia Sophia. 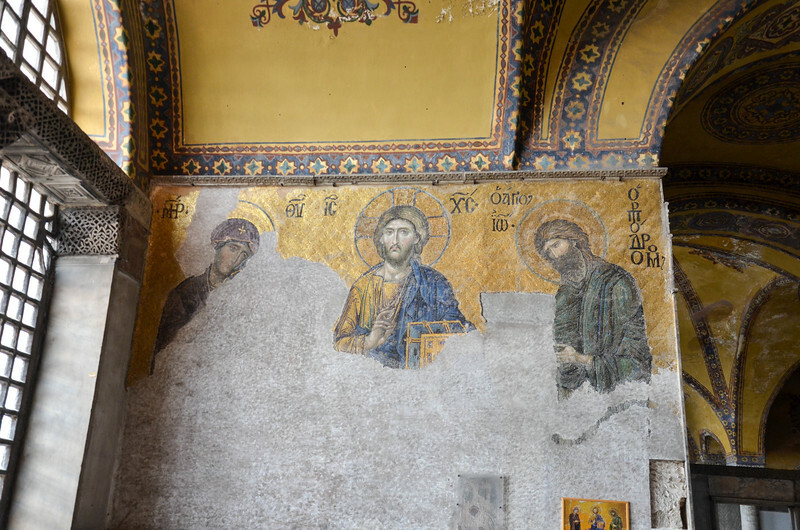 Building fragments outside the Hagia Sophia from one of the earlier churches built on this site. 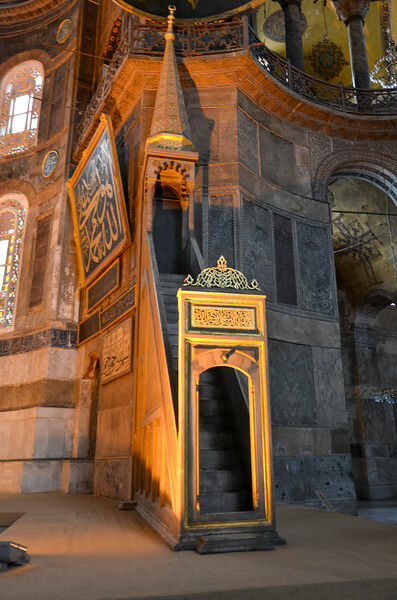 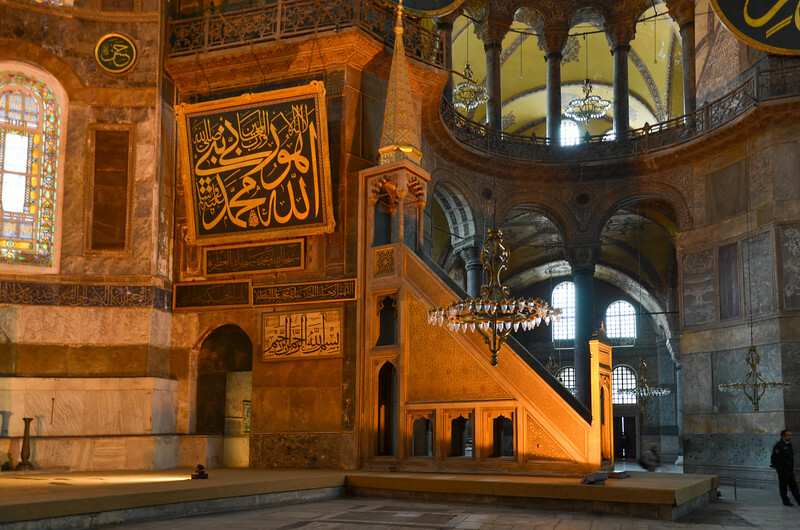 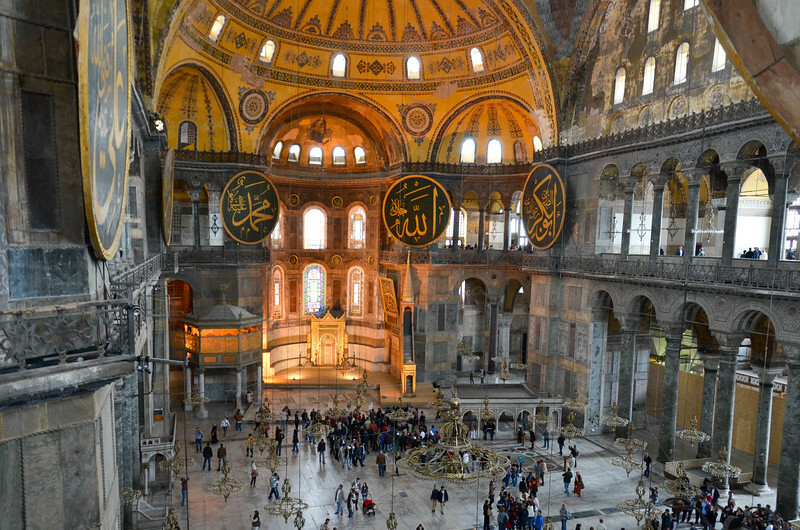 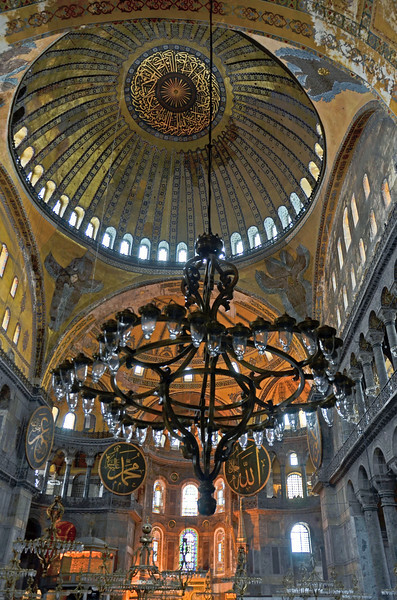 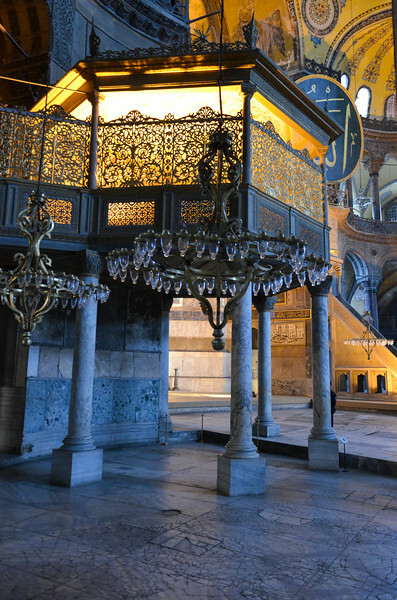 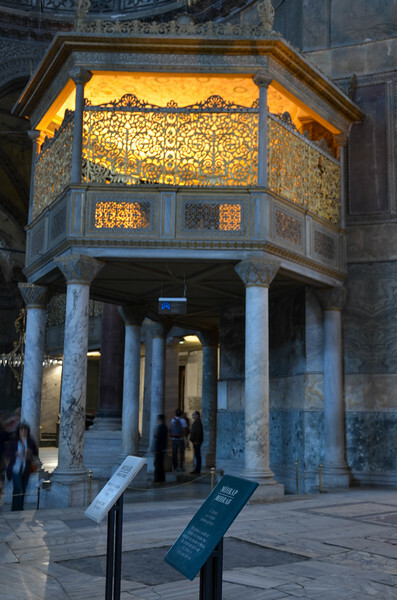 Inside the Hagia Sophia (532-537 AD). 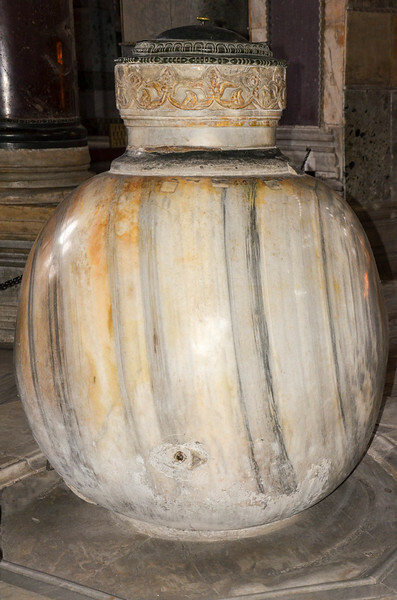 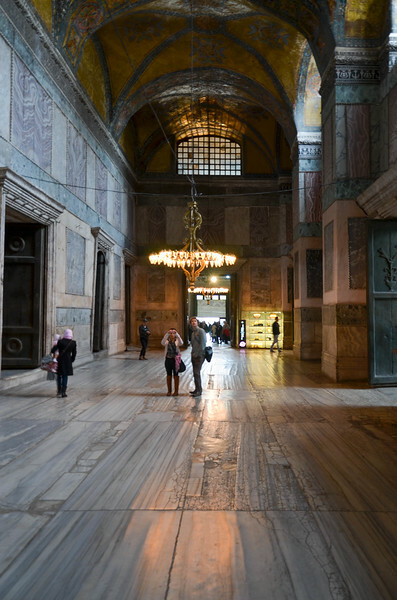 This spot on floor of the Hagia Sophia was where sultans were coronated. 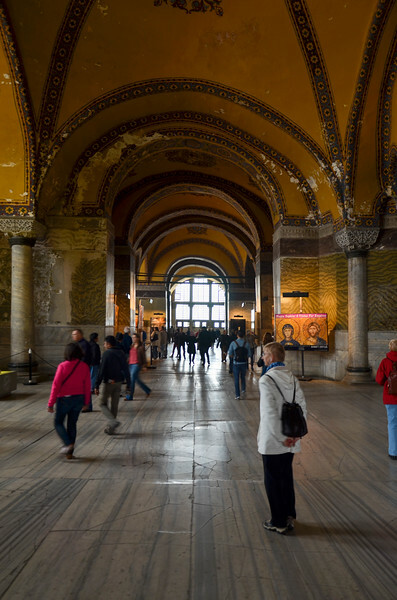 Walking up the ramp inside the Hagia Sophia to the upper level galleries. 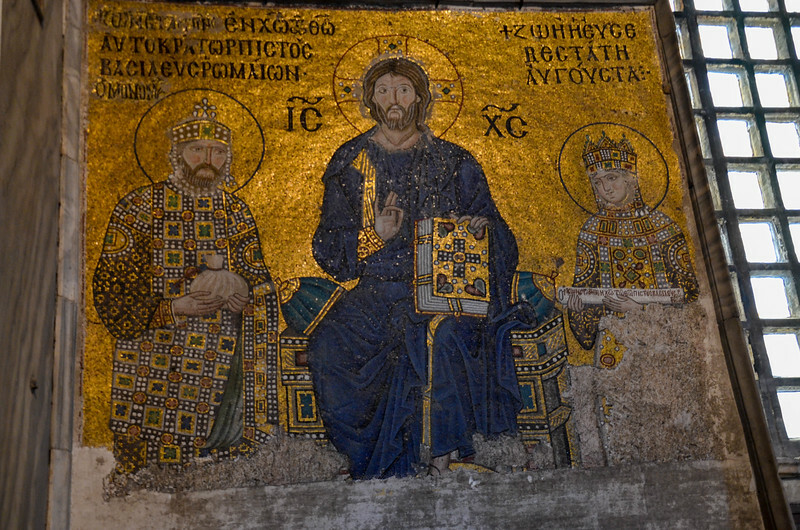 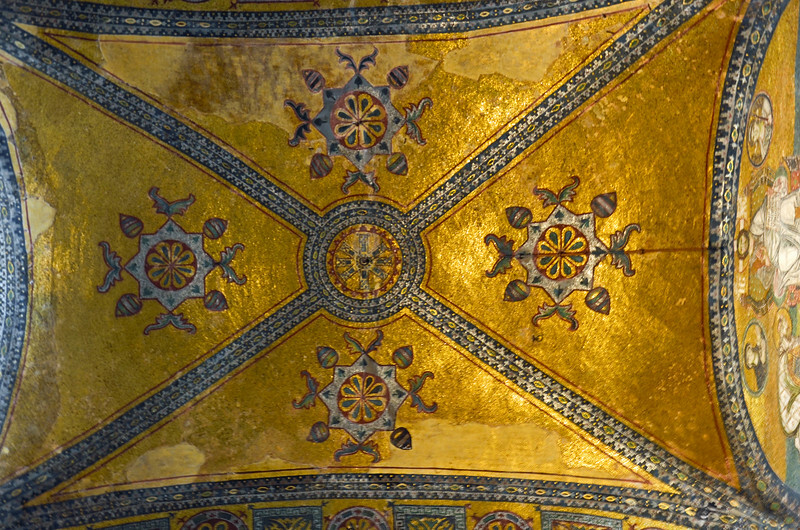 Mosaic inside the Hagia Sophia. 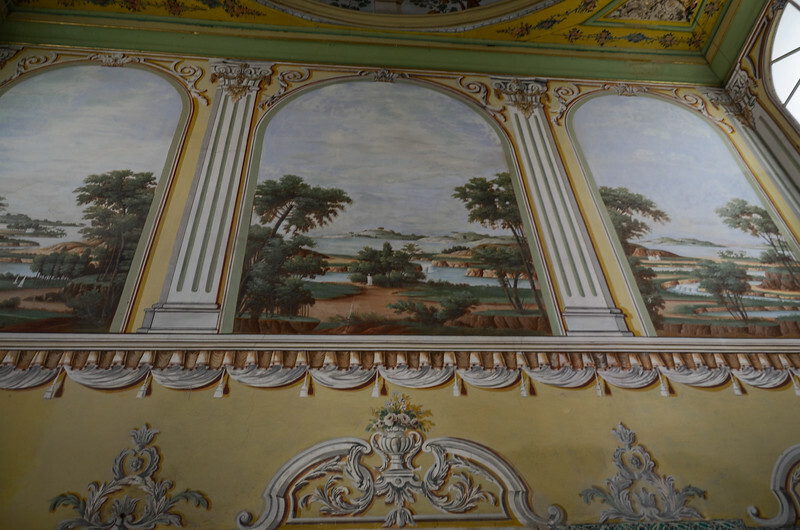 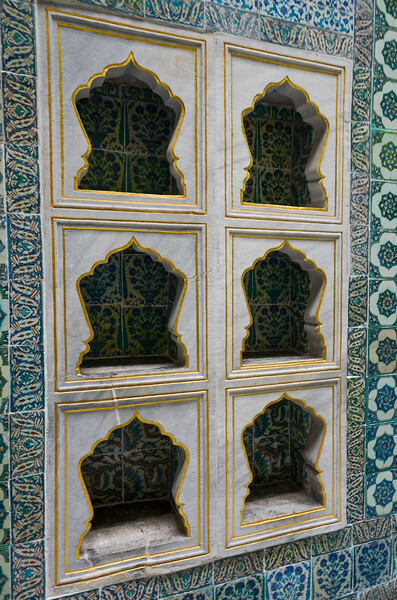 These mosaics were plastered over when the building was converted from a church to a mosque. 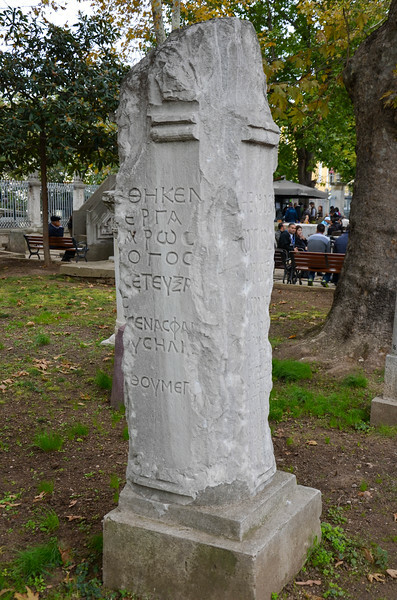 This one was badly damaged, and this is all that remains. 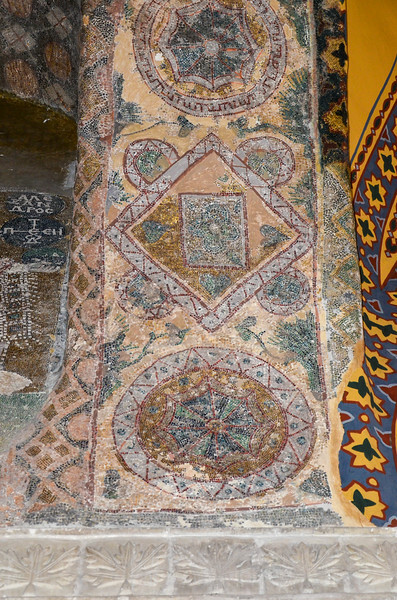 Mosaic inside the Hagia Sophia. 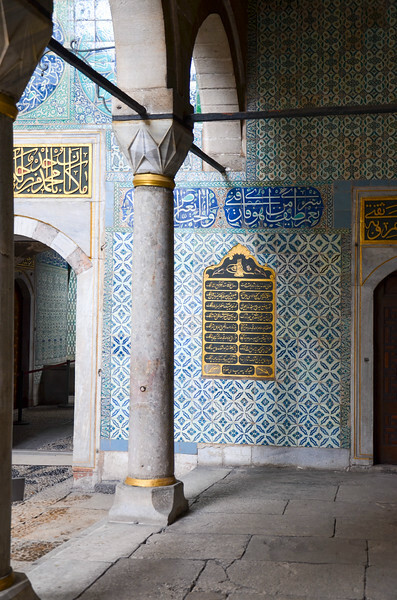 These mosaics were plastered over when the building was converted from a church to a mosque. 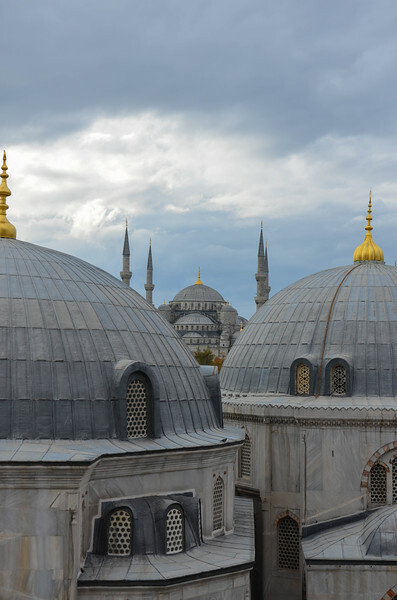 A view of the Blue Mosque from the Hagia Sophia's upper gallery window. 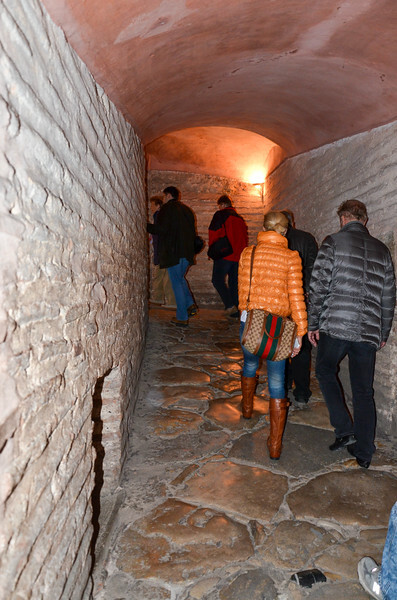 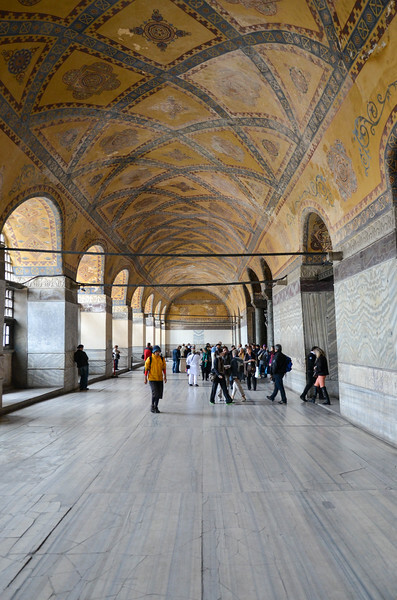 One of the Hagia Sophias long corridors. 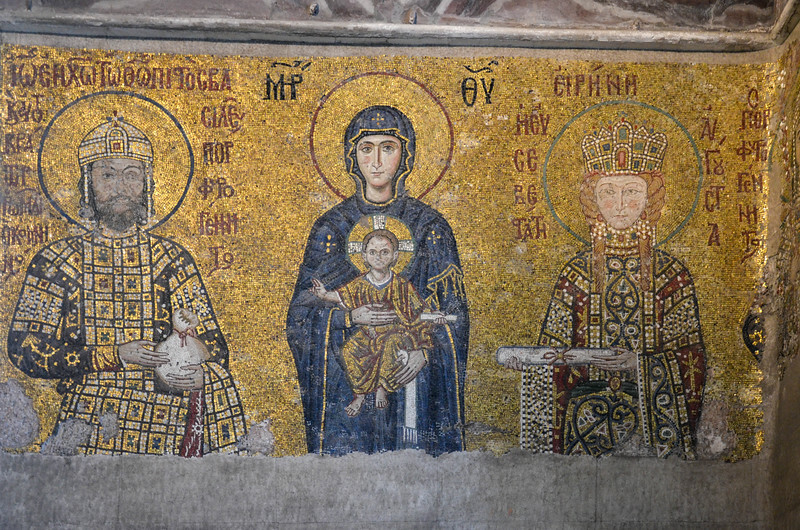 A group of women outside the Hagia Sophia. 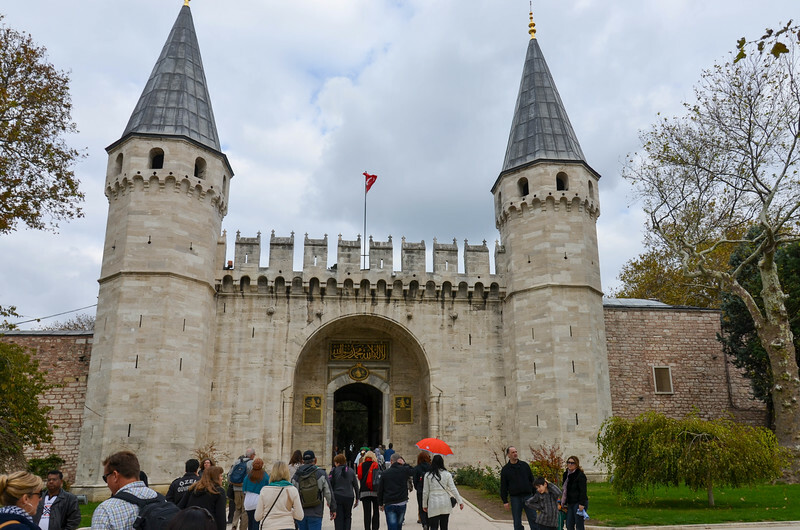 The Imperial Gate, entrance to the First Courtyard at Topkapi Palace. 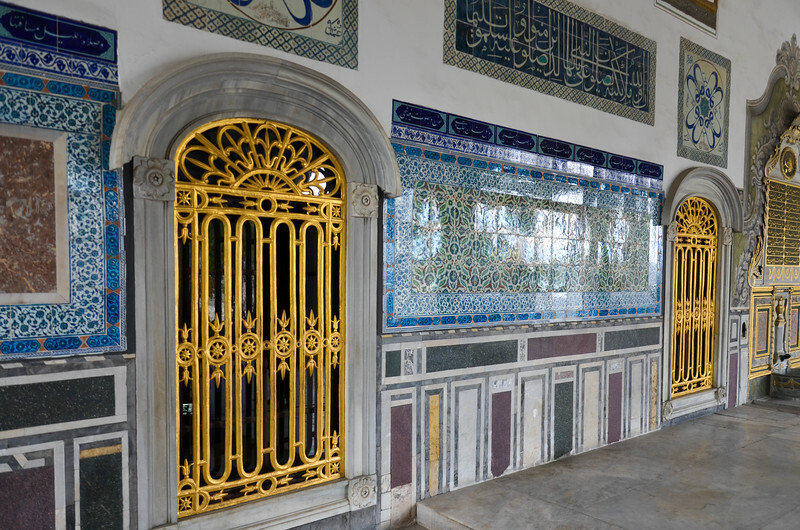 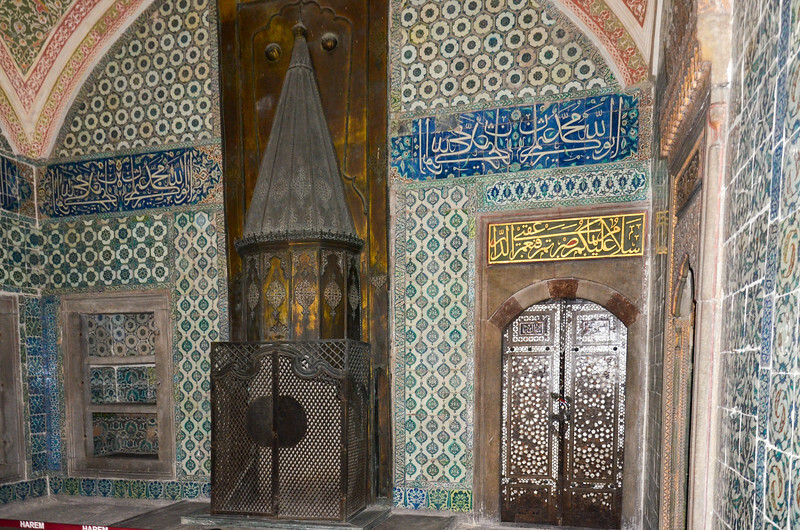 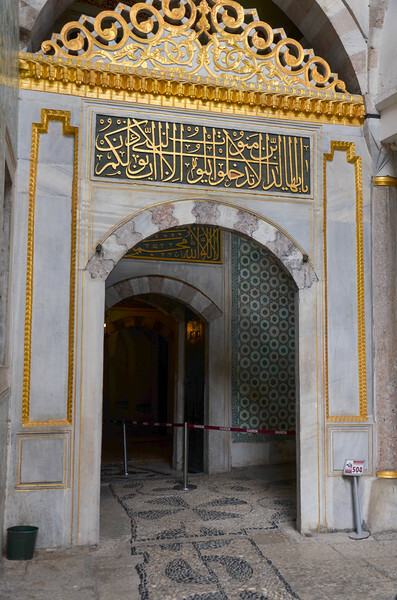 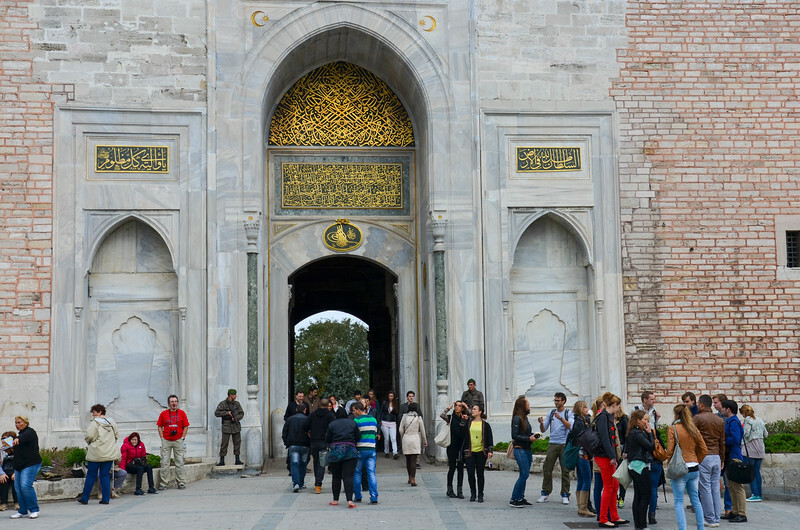 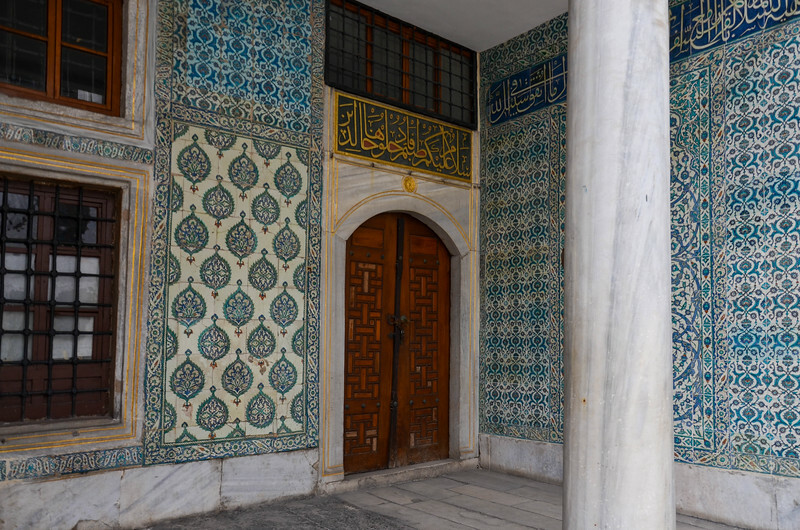 The Gate of Salutation, the entrance to the Second Courtyard at Topkapi Palace. 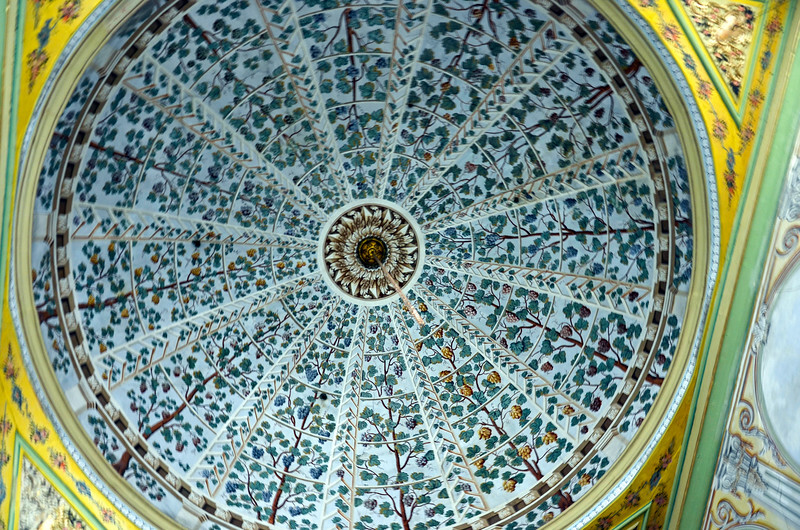 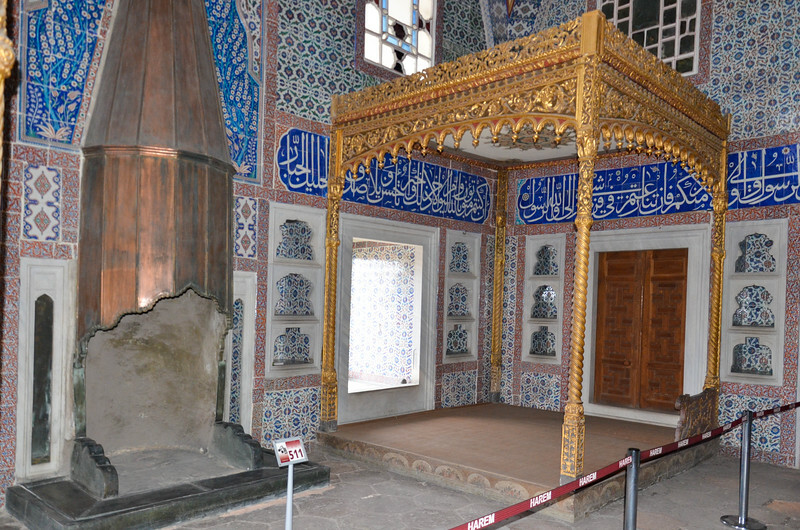 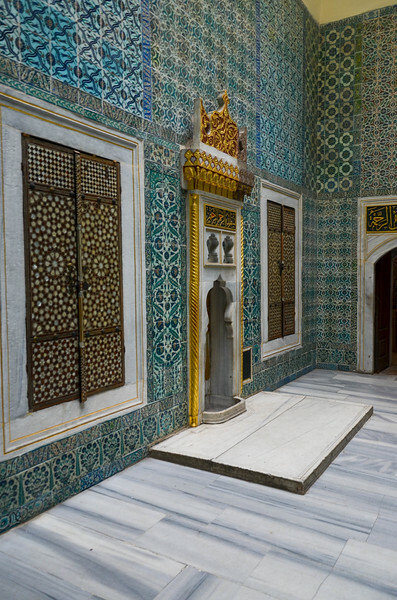 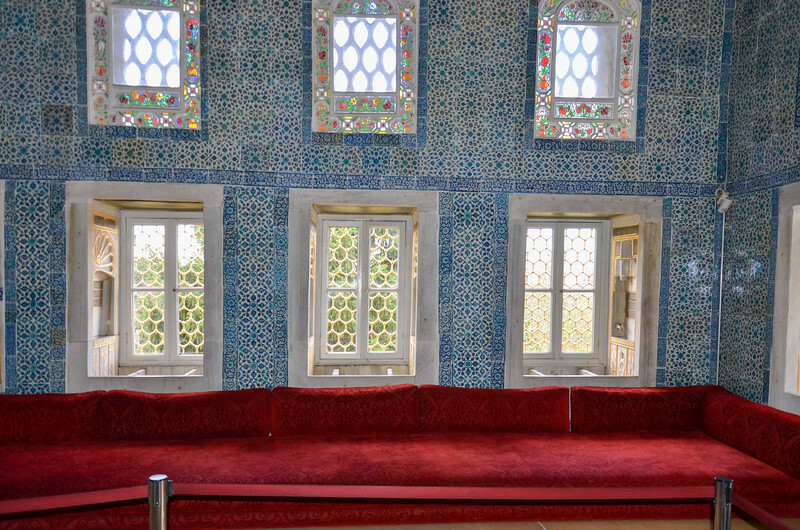 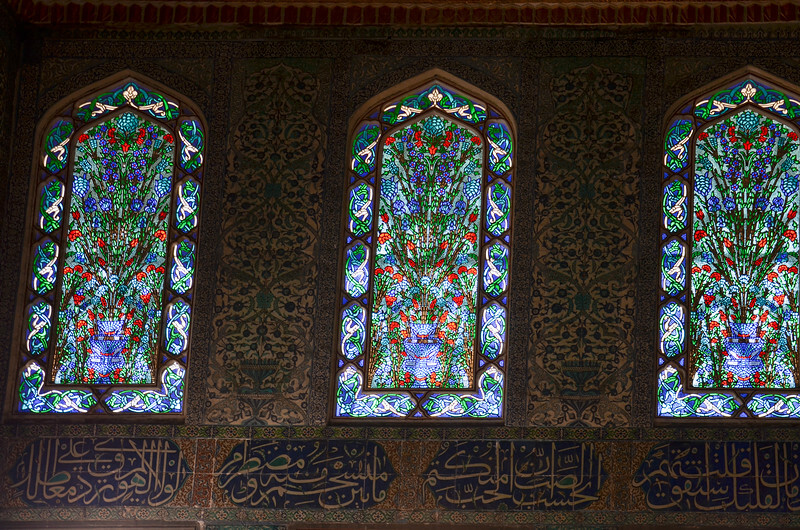 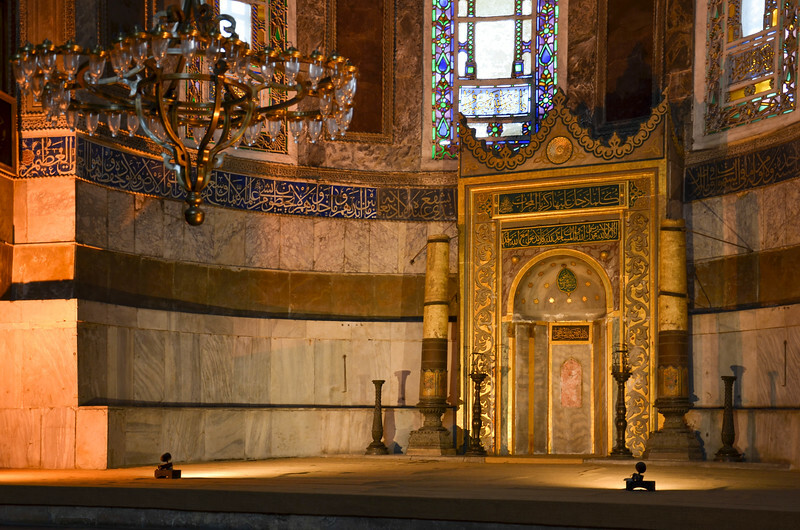 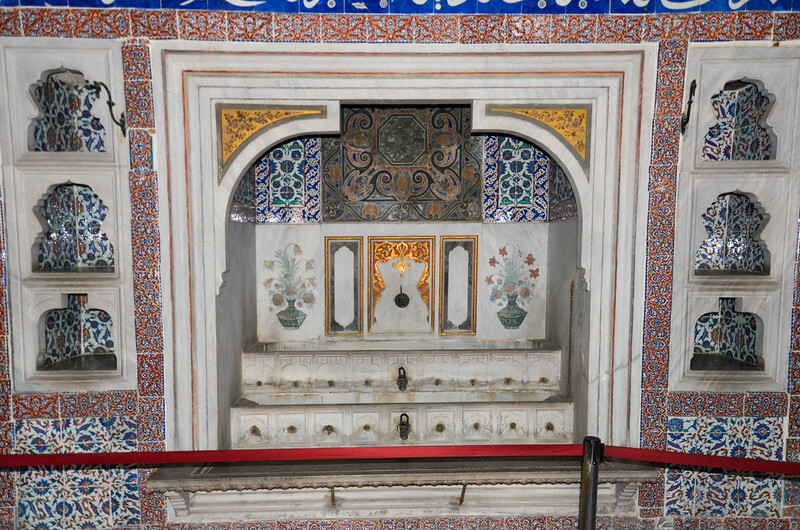 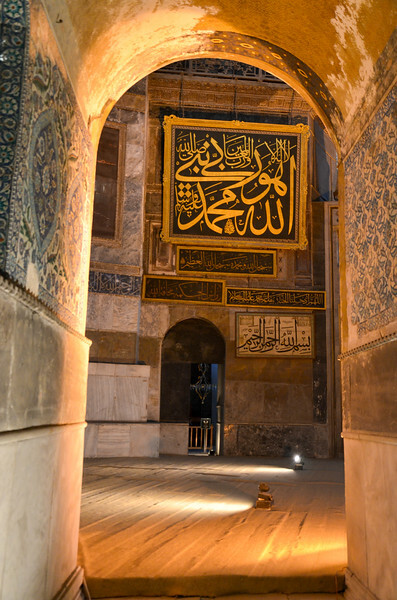 Inside the Harem at Topkapi Palace. 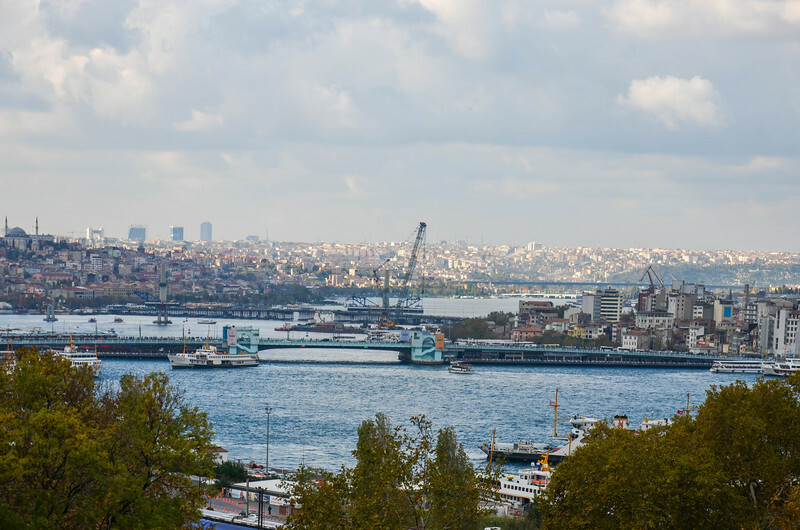 The Golden Horn and Galata Bridge, as seen from Topaki Palace.